X-Ray Shows Aura Leaving Body and Vanishing as Man Dies. 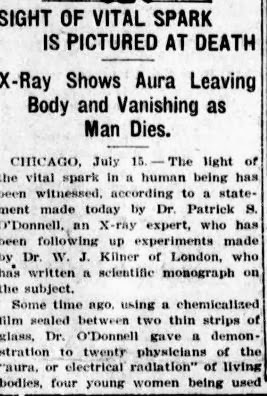 Chicago, July 15-The light of the vital spark in a human being has been witnessed, according to a statement made today by Dr. Patrick S. O’Donnell, an X-ray expert, who has been following up experiments made by Dr. W.J. Kilner of London, who has written a scientific monograph on the subject. 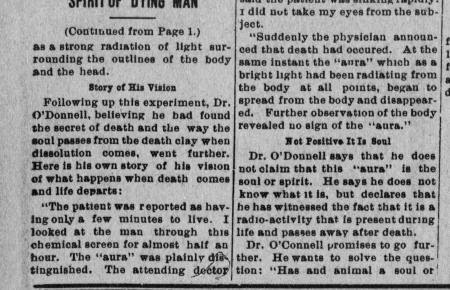 Some time ago, using a chemicalized film sealed between two thin strips of glass, Dr. O’Donnell gave a demonstration to twenty physicians of the ‘aura, or electrical radiation’ of living bodies, four young women being used as subjects. The aura developed as a strong ray of light surrounding the entire form of the subject. 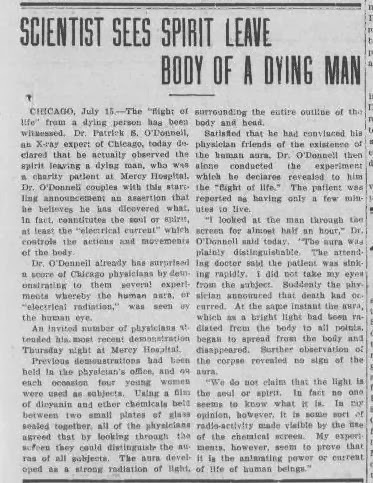 ‘Last night,’ said Dr. O’Donnell, ‘in the presence of several physicians at Mercy Hospital, the experiment was made on a dying man. He was rapidly sinking. Suddenly the attending physicians announced that the man was dead. The aura began to spread from the body and presently disappeared. Further observation of the corpse revealed no sign of the aura. I also apologize for only transcribing one article. Initially I was only going to post the first one, but then I stumbled upon the others and decided to post them all.